Originally posted: November 4, 2017 . Last modified: December 19, 2018 . Sponsored Post: This post is sponsored by JELL-O but the content and opinions expressed are my own. Celebrate Thanksgiving with this fun, family-friendly, inspired chocolate pudding dessert. It’s simple to prepare and can get the whole family in the kitchen. For years, on Thanksgiving Day, Kim and I would go crazy in the kitchen. There’s always something complicated or time-consuming to prepare. Unfortunately, that usually left our son bored and spending time in front of the T.V. A few years back we decided to make a change in our routine. That’s how JELL-O Chocolate Pudding became a staple in our kitchen. It’s one of our go-to products to get our teenage son in the kitchen. We always keep it on-hand to whip up a simple indulgent treat. At times we will make parfaits or use it as a pie filling. However, Kim’s grandmother shared one of her recipes that uses JELL-O pudding. We couldn’t wait to add our own spin to the recipe and share it with you. Now, when the holidays come around, our son cannot wait to jump in and help us make a quick, easy dessert. Best of all, they have a sugar-free chocolate pudding mix. It’s perfect for when he wants something sweet, but we think he needs to watch his sugar intake. Speaking of substitutions to cut down on sugar and fat, this recipe is perfect for doing a little ingredient swapping. For example, use a sugar-free instant JELL-O pudding with skim milk, or fat-free cream cheese. You can even try a gluten-free baking mix for the crust. In other words, you can use this recipe but still make the dessert your way. First, remove your cream cheese and butter from the fridge and let it soften for at least 45 minutes. While it’s softening, go ahead and preheat your oven to 350 degrees F. Also, spray a 9×13 inch glass baking dish with non-stick cooking spray. In the meantime, you can begin preparing the first layer. In a large mixing bowl, combine the flour, butter, walnuts, and powdered sugar. Mix all the ingredients well and then place the dough into the baking dish. You will need to press the mixture into place until the bottom of the pan is covered. It should be around ¾ to 1 inch in thickness. Place it in the oven to bake for at least 20 minutes or a little longer if you want it toasted. Next, allow the crust to cool for around 20 minutes by placing your dish on a cooling rack. At this point, you can start preparing the second layer. In another large mixing bowl, combine the cream cheese, whipped topping, and more powdered sugar. Use a stand mixer or hand blender to whip everything together. Once it has blended, pour the filling over the cooled crust. Use a spoon to even out the cream cheese filling. Kim usually likes to place the dessert into the fridge to cool while she and our son work on the third layer. Which, in our opinion is the best part, the Chocolate Pudding! Then, take the pudding and spread it over the cream cheese layer. Feel free to use a spoon or spatula. It doesn’t have to be perfect because there’s still one more layer to go to finish up this recipe. Go ahead and place the dish back in your fridge for 20 to 30 minutes, to let it firm up before proceeding. Finally, we have to come to the last part of the treat. It happens to be the easiest part of the dish. The last layer consists of whipped topping and is garnished with some extra chopped walnuts. The nuts are optional for this part, so no worries if you don’t want to add them. If you want your dish to be pretty, try using a frosting knife. Tools like that make any topping shine. Place the dessert back into the fridge to set for at least 30 minutes. The longer it stays in the refrigerator, the more it will hold up to being sliced. That’s all there is to making our JELL-O inspired Four Layer Chocolate Pudding Dessert. We invite you to give this recipe a try this Thanksgiving. Use it to get your family into the kitchen. There are enough simple layers there to get even the most inexperienced cook involved. As always, I wish you a long life, love everlasting, and on occasion, a tummy full of sweet treats. Preheat your oven to 350 degrees F. and spray a 9x13 inch baking dish with non-stick cooking spray. In a large mixing bowl, combine the flour, softened butter, walnuts, and powdered sugar. Blend the ingredients into a dough and then press the dough into a 9x13 inch pan. Bake in the oven for at least 20 minutes. Remove it from the oven and let it cool for at least 20 minutes. In a large mixing bowl, combine the softened cream cheese, whipped topping, and powdered sugar. Mix the ingredients until they are smooth and creamy. Pour them into the baking dish over the crust. Use a spoon or spatula to smooth out the mixture and cover the entire crust. Return the dessert to your fridge while you make the next layer. In a large glass or metal bowl, use a hand mixer to blend the instant pudding mix and milk. Make sure the pudding is completely mixed, then pour it over the cream cheese. Again, use a spoon to smooth and even out the layer. Place the dish back in the fridge for 20 to 30 minutes to set up. Remove the pan from the fridge and use a spatula or frosting knife to spread out the whipped topping. You can also garnish the top with the walnuts or skip that part. The calorie count listed is an approximation, actual calories may vary based on serving size and ingredient substitutions. I have 1.4oz boxes of pudding so how many boxes do I need to use ? Good afternoon, Darline! Thank you for commenting and asking a great question. I understand there are different sizes of boxed pudding. I plugged the numbers into my calculator and it looks like you would need 5.57 boxes of the 1.4-ounce pudding for the entire recipe. So, I would round up to 6 boxes because having a little extra pudding shouldn’t hurt the dish. Thank you again for commenting and have a lovely Wednesday. You say to make the crust up to an inch thick, will it shrink down so it’s not too thick? Almost an inch seems awfully thick. I’m making this tonight for tomorrow and it sounds yummy. Can this be made without walnuts in the crust? One family member has a nut allergy. Thanks. Hi Lynn! I haven’t tried it without walnuts, but using a shortbread crust would be a great substitute. Our Carmelita recipe uses a shortbread crust, but it may need to increased by half to fit a 9 x 13 pan. 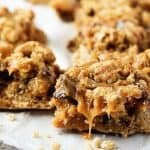 Here’s the link if you’d like to see it https://www.berlyskitchen.com/chocolate-oat-carmelita-bars/. If you decide to omit the walnuts, please let us know how it turns out. Have a great day! I love this dessert, but am wondering: Would it be just as yummy if I used sugar-free pudding, low-fat milk and low-fat cream cheese? Have you tried it that way? Good Morning Nancy, great question! No, we have not tried it that way. Personally, I don’t care for the taste of sugar-free desserts. I feel the sweeteners tend to have a chemical after-taste and the lack of fat leaves the dish flat. However, that’s just how my taste buds work. If you enjoy the flavor of sugar-free and low-fat alternatives, then I would say yes, go for it. Also, I would never deter someone from modifying any recipe to meet his or her dietary needs. That’s what cooking is all about 🙂 In fact, I modify recipes for personal use all the time. For example, when a recipe uses cream cheese to thicken a dish and give it a creamy texture, I typically make a blonde roux instead. By using butter, cream, and flour.